Tonight's special episode of City Connection focuses on empowering voters to know their rights. City Connection - November 2016 - Know Your Voting Rigths from GRTV on Vimeo. Join us today, Monday, November 7 from 5 to 6 p.m. on GRTV’s LiveWire, Comcast Cable 24. 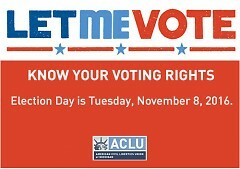 ACLU Attorney Miriam Aukerman and Rapidian Community Journalist Amy Carpenter-Leugs join host Linda Gellasch for a special episode of City Connection to discuss Tuesday’s elections and what you need to know about your voting rights. Questions from citizens will also be answered live on the show. Aukerman will discuss why voting is important, how you can prepare to vote, recent electoral reform here in Grand Rapids, and what to do if you encounter problems at the polls. Carpenter-Leugs will discuss the county elections, specifically the Kent County Sheriff race, and the importance of citizen involvement. You can ask your questions about voting and voting rights by posting in the Facebook event, calling in at 616-459-4881, emailing, tweeting or just posting a question in the comments section at the bottom of this page. This post has now been updated with the link from yesterday's episode.